! - İzdihër - ! 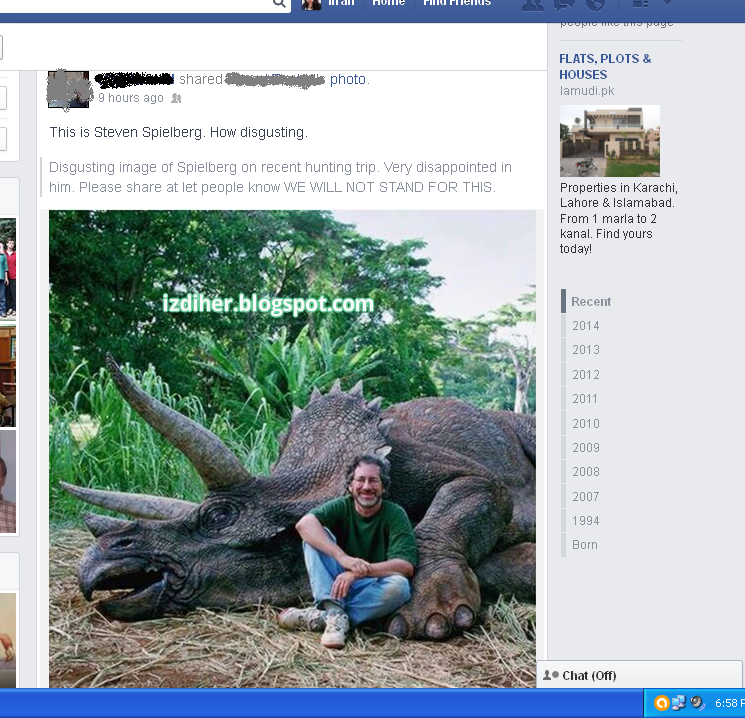 : # Disgusting image of Steven Spielberg. # Disgusting image of Steven Spielberg. Disgusting image of Steven Spielberg on recent hunting trip. Very disappointed in him. Please share at let people know WE WILL NOT STAND FOR THIS. People are so out raged at him and sharing this pic with a message " We will not stand for this. " He is cruel and disgusting, isn't he ? 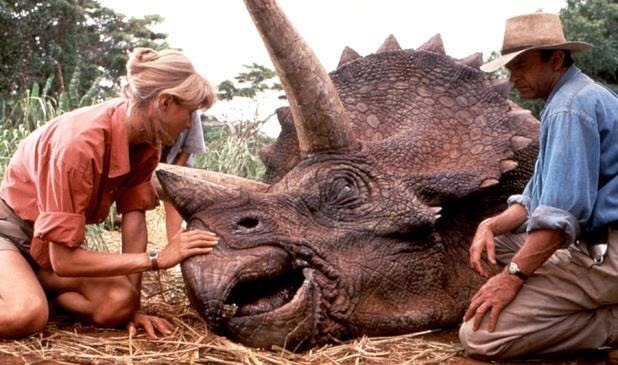 The animal in that pic is a #Triceratops, just a prop from movie Jurassic park not a rhinoceros about which people are outraged. Sad part is that we can't save them. They are no more in our world any more. But more sad part is that people have this feeling they are creating awareness by sharing that specific pic. Actually they are mocking him. Sharing things to create awareness is so common on social networking websites. It is good, but in my humble opinion, we really need to do some research and using common sense before sharing every other thing. About Steven Spielberg, I reckon instead of mocking him like that, we should be thankful for him for giving us such an amazing film of all time. Most of us had no idea for what actually dinosaurs are before it. It was ahead of its time and still amazes us. Am i strange, but i recognized the creature immediately (was my "favorite dinosaur as a child) and thought it was just a funny image, not one that mock ant thing - oh well people are sometimes stranger than i! People need to chill out and get a life. I would have had the same pic taken of me if I had the chance. In fact I'd probably would have put on my hunting clothes and held my rifle. 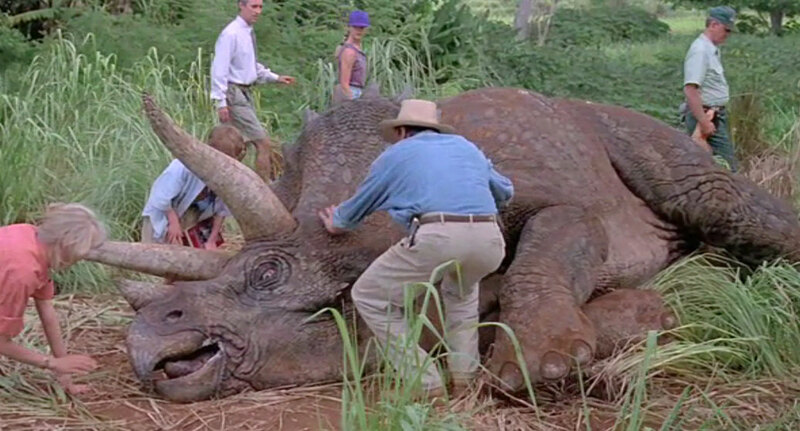 People actually thought this extinct triceratops was a rhinoceros? Well, very few people have actually seen a rhinoceros. Only a fool would get hunting pictures clicked. Mr Spielberg is anything but that. People can be so oblivious at times, accusing someone without getting the facts straight. Are these real snaps??? i seriously doubt. Agree what you wrote in the end , Ifrah! I cant believe he is so cruel, I say we all ban his movies, anyone who is that cruel doesn't deserve our money! !